Concert Hall acoustic wall design refers simply to play music, but cannot performing stage arts building of music venues. Performances and spectators are their main features together in one space. For a large Symphony Orchestra concert hall, if the reverberation time should be between 1.8~2.0s is the best. For smaller concert hall, concert hall, Chamber Music Hall and other purposes, the reverb time ideals value as shown below. For the reverberation time of 2.2s concert hall, BR optimum value is between 1.1~1.25 and concert hall reverb time 1.8s or shorter, optimal values between 1.1~1.20 BR, between the reverberation time of 1.8~2.2s Concert Hall, its optimal value can be determined by the insertion of the BR. Acoustics design measures: shape; there should be more of the early reflections. Bounded by 80ms, the width between the two walls value at the source for 17~18m. The sound parameters: effective sound at the receiving point and void ratio of acoustic energy (C80). Ratings higher Hall, C80 values smaller, concert hall, optimization of Stope C80 value should be between -1~4. The initial time delay gap of early reflections (T1), optimum design value is 20s, more than 35ms is negative. Acoustics design measures: shape; the time difference between the direct sound and reflection sound (is about 20ms), the distance between the reflector and receiver is about 7m. Acoustics design measures: shape; early reflections of time-space-energy should reasonably distribution. 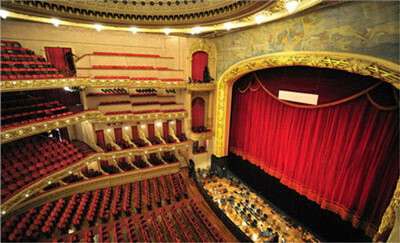 C. Classical period, hundred seats of concert halls, its T60 is about 1.0~1.3s; the romantic period, 500~800 seats of concert Hall, its T60 is about 1.5~1.7s.